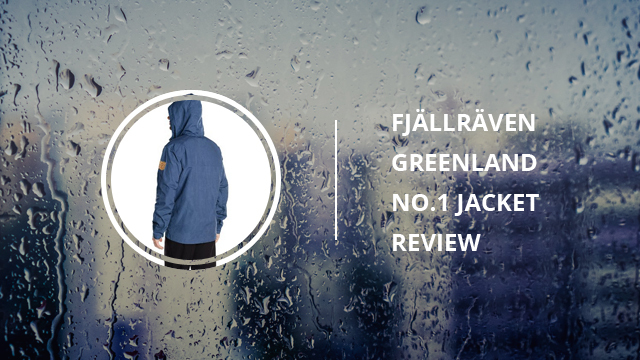 Continuing our series of reviews, today we will introduce you to a new jacket and its specifics, the Greenland No.1 Jacket for men by Fjällräven. Much like in the previous article, we will also divide this one into categories, which include the material of the jacket, when is it suitable to wear, the color selection and feedback from those who have tried this jacket for themselves. For those who enjoy hiking and getting out there in challenging weather conditions, this jacket will most certainly interest you. The design for the Greenland No.1 was originally created in 1968 and its purpose was to provide comfort and warmth while being outdoors. 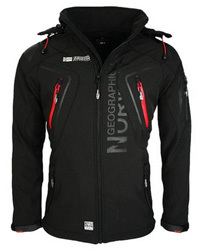 Today, this jacket’s design has developed both in style and features. As mentioned above, this jacket’s original design was intended for it to be worn in outdoor activities. 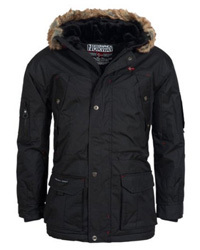 It is a down jacket and comes in a combination of cotton and polyester, which we will detail in the other paragraph. The purpose of this jacket is to keep you warm and dry and it being a Swedish jacket says quite a bit about the kind of weather it can withstand. It is very suitable to be worn during most mountain activities, such as hiking and camping, since it’s a very durable jacket, with waterproof and wind resistance qualities. The reviewer in the video below wore it in -24° Celsius, and it fared pretty well, allowing him to remain warm despite the low temperatures. However, something that needs to be mentioned, is the lack of hand pockets. There are breast pockets, for carrying small items such as phones, music players, keys and wallet, and also an oversized inner pocket, but no traditional side pockets. 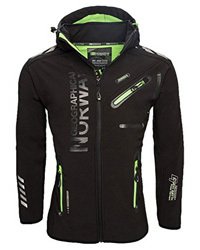 This jacket closes up with a zipper and buttons, so it has a double protected closure, for insulation, which is also aided by the high collar, and oversized hoodie. When taking a look at the style alone, this jacket gives the impression of an oversized casual shirt. This is important, because it allows the user to wear it in casual occasions and even daily, thus eliminating the need for purchasing several jackets. The material combination, is made up of 40% Cotton and 60% Polyester. 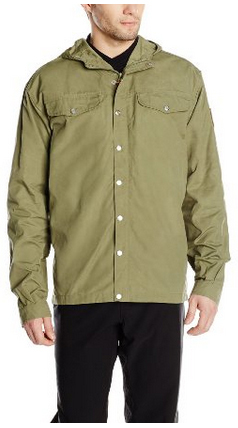 The polyester is recycled and the cotton organic, making this jacket eco-friendly. It has a layer of down feathers both in the body as well as in the hood, providing considerable warmth. The polyester is high quality and very durable. This makes the jacket to last for a really long time and even if worn daily, will not suffer tearing, wearing down or having feathers come out. It is also water-resistant and wind-resistant, with proper insulating features in the design. These include the tight cuffs that are a bit longer than normal, the high collar, the double covered zipper closure and the hood. These are especially important during camping, where the time spent in the cold and sometimes wet conditions, is long and requires suitable clothing and gear. The colors for this jacket are: Dark navy, Black, Green and Uncle blue. There are no patterns or color details, so the jacket is monochromatic, which goes quite well with the shirt-like look. These colors are easy to combine and they go well with most clothing styles and patterns, so you really cannot go wrong, with whichever you might choose. Reviews from people who have purchased and tried something for themselves is often a very helpful way of determining if something is worth the try. The reviews for the Greendland No.1 highly praise the design and ability of the jacket to withstand the freezing temperatures. It is a very comfortable jacket to wear, quite lightweight and since the design is a bit on the looser side, it makes movement easier. According to some reviewers, the whole design of the jacket is ideal for traveling with, because it will not cause hindrance or make you uncomfortable when carrying a traveling backpack. Despite not having the hand pockets on the sides, the three other pockets will provide enough room to carry essentials, therefore to most of the users it is not a downside at all. And since clothes do say something about the person wearing them, this is a very nicely styled jacket, and reviewers comment on compliments they receive because of the look of it and how good it fits. 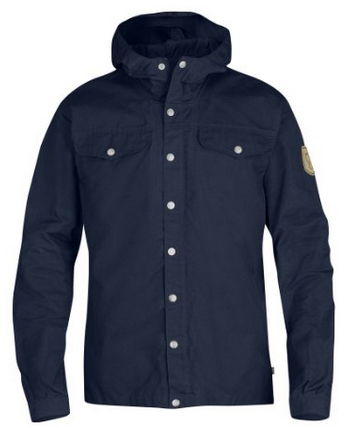 To conclude our review, the Fjällräven Greenland No.1 jacket for men goes well with different styles and occasions. It can be worn in activities such as hiking and camping in low temperatures, or as a daily jacket during the winter season. 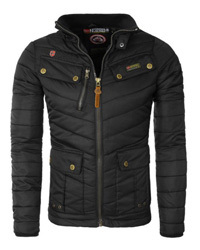 You cannot go wrong with this jacket, be it in style or quality.